A number of new home communities are being developed in the Palm Springs real estate market including houses for sale in Palm Springs located in both golf communities and non-golf communities and in all price ranges. Having your own personal Palm Springs real estate agent guide adds a layer of objectivity to your new home experience. Top agents such as Sheri Dettman & Associates will likely be able to offer additional information about each new home community that interests you that many onsite agents might not know including using the local tax roles and title company information to discover what prices other buyers have paid for similar homes. 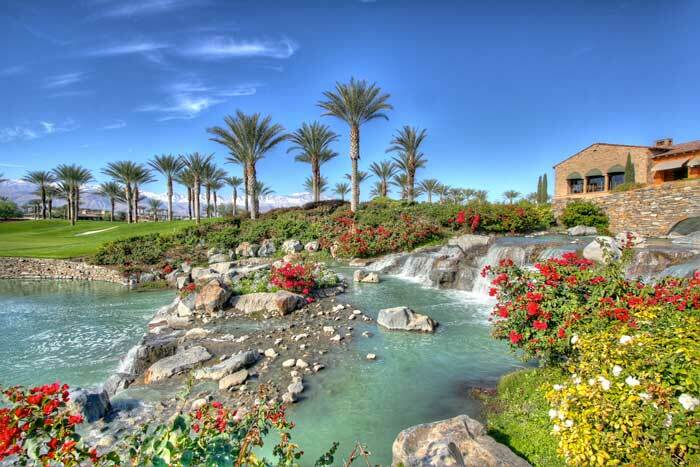 Stonefield Estates At Santa Rosa in southwestern Indio is a gated community of just 41 luxury homes (20 completed and 17 sold to date) on impressive homesites averaging one half acre. Semi-custom homes at Stonefield Estates range in size from 3,515 to almost 4,900 square feet with three to five bedrooms and up to five bathrooms in five distinctive floor plans. New luxury homes being developed at Andalusia La Quinta range from 4,184 to 5,198 square feet and are priced from $1.495 to $2 million. All new homes include extensive upgrade packages including pool, spa, landscaping, built-in grill, upgraded flooring and more. Sheri and her team continue to assist numerous buyers and sellers at Andalusia. These new lakefront homes will offer sweeping views over The Andalusia golf course and to the nearby Santa Rosa and Coral Mountains. New home development at Griffin Ranch in La Quinta is well under way. The impressive Griffin Club offers homeowners and their guests some great amenities in this beautiful non-golf community adjacent to PGA West. Sheri and her team have helped a number of buyers with their new homes at Griffin Ranch. Homes priced from the $800's to the mid $1 millions. Over the years Sheri and her team have assisted buyers of both resale and new luxury homes at Toscana Country Club in Indian Wells. Sheri is in the Toscana community on a regular basis and appreciates the amenities that Toscana Country Club offers its members and their guests. Toscana Country Club homes range from 2,400 to over 6,500 square feet and are offered in both custom home and semi-custom homes from $1.2 to over $5 million. A variety of golf and social/fitness membership programs at Toscana are available.